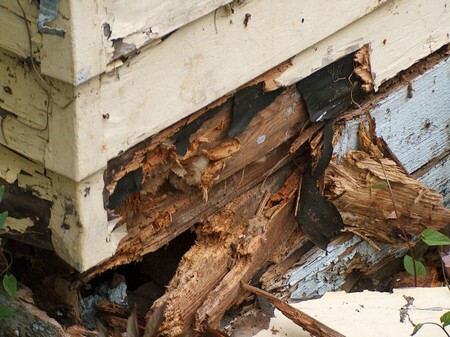 An attack of dry rot is generally much more extensive than il appears at first sight. Sometimes when the first visible symptom is a fruiting body on the surface of a skirting board, the actual area affec­ted may be many square metres. To eradicate dry rot it is essential to trace out the full extent of the attack, taking up floorboards and pulling off lath-and-plaster wallcoverings to find out just how far the fungus has spread into the adja­cent brickwork. As when dealing with wet rot, the source of the initial dampness that enabled the fungus to develop must be found and treated. If ventilation below the floors is poor it must be improved. All decayed wood that shows signs of attack or growth of fungus should be cut out taking with it a margin of about 450mm of sound wood beyond the last visible signs of attack. If dry rot is found on one side of a wall, the fungus will probably have penetrated to the other side too, so woodwork in the adjoining room must also be carefully inspected. After removing all decayed wood, the plaster should be stripped from the walls until no further fungal threads are found on the surface of the brickwork. Then strip off another 300mm or so beyond this as a safety margin. Collect all infected wood and plaster in large polythene bags and either burn it or dispose of it as quickly as possible. After stripping off the plaster, remove any pieces of wood, such as fixing blocks, which are embedded in the wall. Brush down the surface of the brickwork and take out any loose mortar from the joints. Before replastering the wall, swab down the surface of the brickwork with a fungicide specially formulated for treating infected walls. Apply the fungi­cide until the surface of the wall is saturated: use cither a large brush or a coarse spray from a low pressure sprayer (never use a fine spray). Always wear a face mask and PVC gloves when applying a fungicide. So far as is possible, new timbers should not be brought into direct contact with the old brickwork for example, rest the ends of new joists on fell where they enter a wall. As an additional pre­caution, brickwork around window or door openings should be covered with a fungicidal rendering where it comes into contact with new wooden frames. All new timber used in repairs should be thoroughly treated with a wood pre­servative. Give new joinery and flooring two full flowing brush-on coats and stand the ends of joists in a bucket of preservative for at least ten minutes. Sound timber exposed during the work should be brushed over with a preserva­tive to kill any infection that might be on its surface. 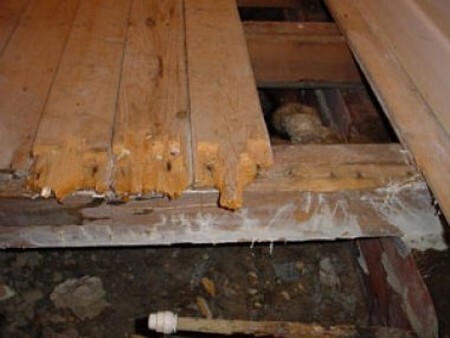 The eradication of dry rot can be a major undertaking requiring a know­ledge of building construction. A limited outbreak can, however, be dealt with successfully by a skilled d-i-y enthusiast by following the lines laid down above. Further advice on the matter can be obtained from pamphlets published by the Building Research Establishment and by the British Wood Preserving Association. Should you decide that the work is beyond your capabilities you can employ a remedial treatment com­pany to undertake the task. In this case, you would be well advised to employ a firm which is a member of The British Wood Preserving Association and one which offers a guarantee on its work. Like guarantees for chemical damp courses, you can obtain additional cover from the Guarantee Pro­tection Trust who will take over the guarantee if the original firm goes out of business.